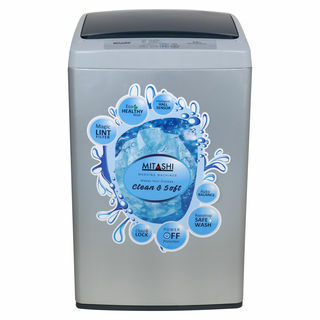 The price for Mitashi 5.8 kg Fully Automatic Top Load Washing Machine Grey ( MiFAWM58v20 ) is valid across Bangalore, Hyderabad, Chennai, Mumbai, Delhi, Pune and Kolkata. The Mitashi 5.8 kg Fully Automatic Top Load Washing Machine Grey ( MiFAWM58v20 ) is available at best price of INR 10490 on Flipkart. Compact, good usability, best price the only dissatisfaction is, I received the system with a small dent. Otherwise everything is fine. way to go, for other merits & demerits.